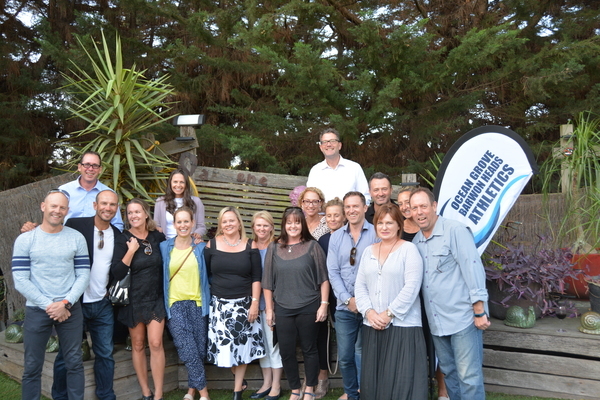 The Ocean Grove Barwon Heads Little Athletics committee met recently to give a big thanks to their sponsors. Those sponsors included the Ocean Grove Voice, Aussie Home Loans, Press Here, Fuschia IT, Spiire, Select Group, Haze Music and Marty@Oakedene. Members of this season’s club committee are Adam Holland, Belinda Cambridge, Ruth Payne (president), Danni Smith and Matthew Payne. The Little Athletics Club has already picked up the ’March Past’ trophy for this season and is looking for further trophies as the season hots up. The club beat eight other clubs from the Geelong region to win the trophy for demonstrated excellence in presentation, club attire and enthusiasm. Many of the club’s little athletes have represented their parent club, Geelong Little Athletics Club, this season at both regional and state relays at Bacchus Marsh and Lakeside (Albert Park) respectively, the State Multi’s (pentathlon) at Bendigo, as well as the regional track and field meet at Werribee. Coming events include handicap and club championships at Landy Field, Geelong, and end of year presentations at Barwon Heads Village Park in April, as well as the state track and field championships back in Albert Park.